Planter fasciitis is a painful condition of the heel; commonly referred to as heel spurs. The mid foot consists of a bony arch and like any archway requires a support strut across the base to prevent collapse. This is a thick sheet of collagen called the plantar fascia. It arises from the heel bone (calcaneum) and stretches under the foot to the toes. Plantar fasciitis occurs when the plantar fascia fails to repair itself as it connects to the calcaneum. 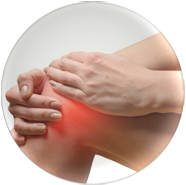 Usual symptoms are of tightness at night time, severe heel pain when getting out of bed and a dull ache with activity. Often it occurs spontaneously but sometimes there was a traumatic event such as a long run on a hard surface. It is a notoriously difficult condition to treat. 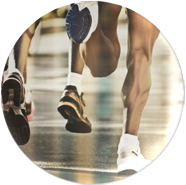 Cortisone injections bring a short duration of relief, orthotics and soft soles can protect and stretching the Achilles tendon is important. Recently plantar fasciitis has been shown to respond to treatment with extracorporeal shockwave therapy. 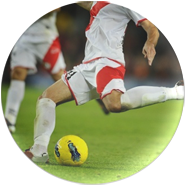 Greater success is achieved when the calf tightness and associated myofascial symptoms are addressed which might involve the additional use of acupuncture in association with the shockwave therapy. 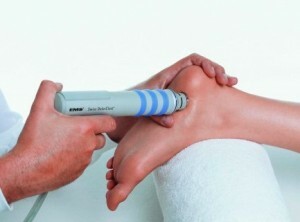 Click here for video of extracorporeal shockwave therapy in the management of plantar fasciitis. Recent systematic review meta analysis of randomised controlled studies has confirmed that extra corporeal shockwave therapy is effective in reducing symptoms of planter fasciitis in the short-term. Studies tended to be relatively short and follow-up therefore there was no evidence of long-term efficacy. My personal clinical experience shows that if people do have a good response to shockwave therapy managing plantar fasciitis then this tends to be long-term in nature.